If there’s one car that stands out on the road, it’s the Soul. Yes – Korean, but with some funky styling. I am surprised we don’t see more of them around, as they seem great value, and those looks…they really grab you. I’ve been wanting to get behind the wheel of a Soul for a while now, so when we were offered one, I jumped at the chance. Is the Soul an unsung hero? Perhaps the Soul is mainly for the ‘café cruiser’ market, and nothing more? Yup, close up and in the flesh, this is a car that stands out from the crowd. 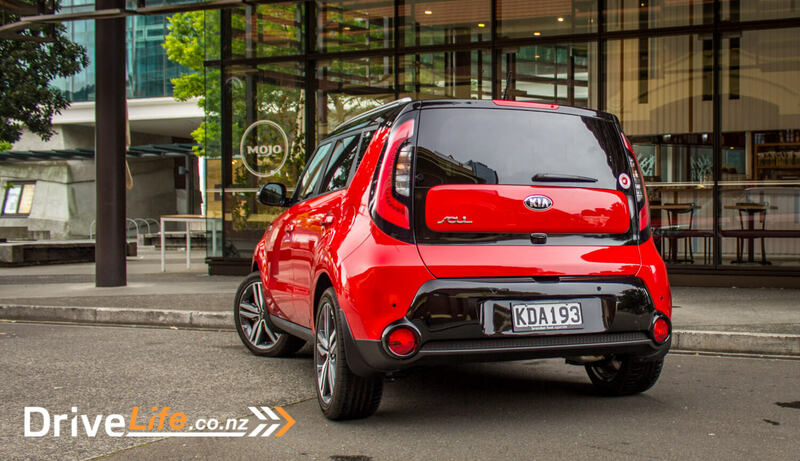 Mainly at the back, with those high tail lights and wide stance – it’s bordering on Love-it-or-Hate-it, but I think Kia have pulled it off. It’s different and attractive, without going overboard. I got lots of looks when either in the Soul, or walking away from it. No doubt the stunningly bright red paintwork helped, but there’s no denying it’s eye catching. The front too looks different than most others out there, although the Skoda Yeti does resemble the Soul in lots of ways. 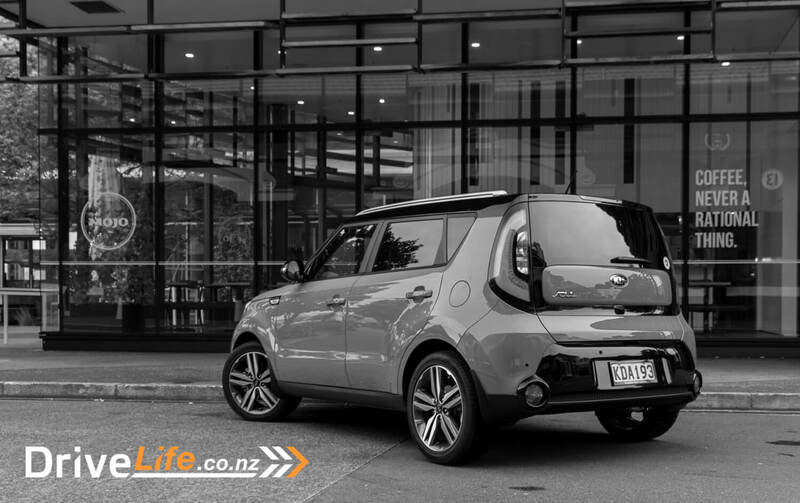 Still, this is no Yeti and you’ve got to hand it to Kia here – they’ve done well, and it feels like it will have some sort of cult status later in life. 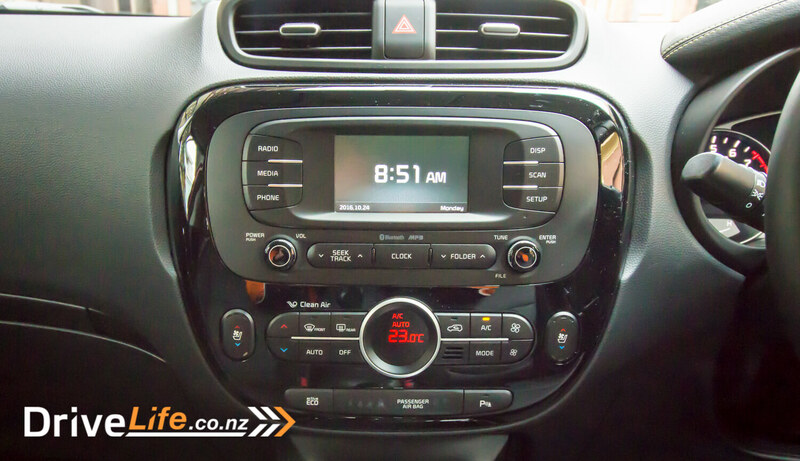 The inside too is a bit different, with lots of use of ‘circles’, according to the blurb I got with the car. Our test car is the SX 2.0, so that means full leather seating, and I always like a bit of leather. 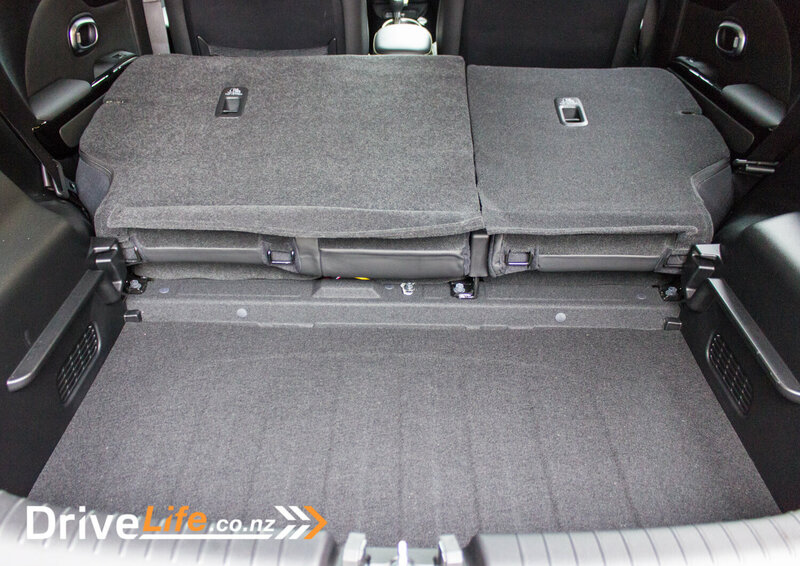 Rear legroom looks above average, and the boot is nicely deep. There’s an option of a false floor to stick in here to hide your valuables, but naturally the Soul comes with a parcel tray too. There’s three models to pick from in the range; the 1.6 Urban, the 2.0 Urban and the 2.0 SX. All are petrol driven. The 1.6 starts at $32,490, with the 2.0 Urban at $33,990 and the SX at $35,490. Really, I can’t see anyone getting the 1.6. The 2.0 uses marginally more fuel but is a lot faster. Also the SX has a good bundle more extras than the Urban 2.0 – for the money, the SX is the only way to go. Base equipment on the two lower models is still good though – remember these are under $35K. Both have low tyre pressure monitoring, 18” alloys on 235/45r18 tyres, lots of air bags, keyless entry, reversing camera, rear parking sensors, projector headlights, DRLs, LED rear taillights, Hill Start Assist, automatic headlights, ‘Flex Steer’ (described later), front fog lights, heated electric mirrors, a 4.3” touchscreen central display, BlueTooth, and manual AC. For just $1,500 over the Urban 2.0, the SX adds climate AC, heated and cooled front seats, full leather, leather steering wheel, 18” machine finish alloys, electric driver’s seat adjustment with electric lumbar adjustment (up/down only), a 4.3” driver’s information display, auto-dipping rear view mirror, keyless start, rear parking sensors, electric folding mirrors, and rear privacy glass. 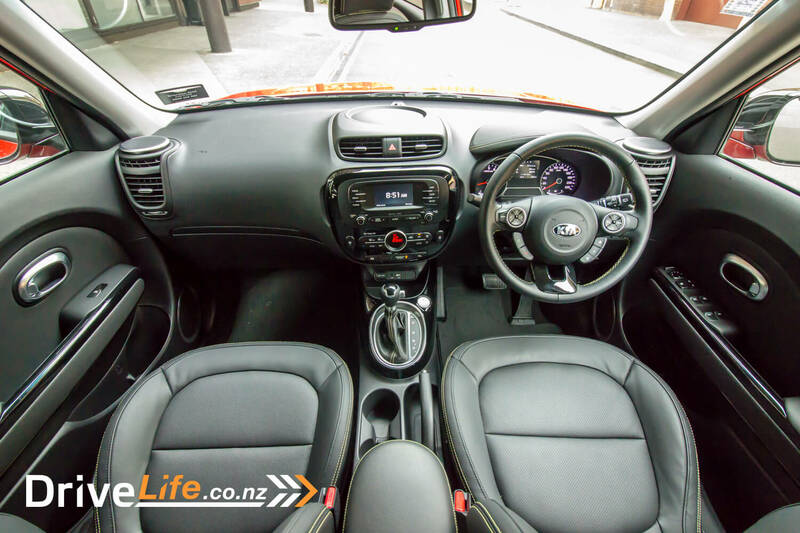 I realise now why the interior looks so good – there’s yellow stitching on the seats, steering wheel and dash – and that always makes a difference. It both lifts the apparent quality of the interior and also (somehow) makes it seem a bit lighter. The Soul does have a two-tone interior, which is a saving grace. After the all-black interior of the CX-9 the other week, the lighter beige colour of the headlining and pillars of the Soul make it seem so much brighter inside. Seat comfort is good too, although they do feel a bit more ‘slidy’ than I would have liked. Minor grumble though, the seats’ comfort are a great feature of the Soul. Speaking of pillars…general visibility out of the Soul is excellent – but for those massive C pillars. They are enormous! The main problem with this is that you would normally then rely on the reversing camera to keep an eye out the back, at least when you are reversing. But the 4.3” display of the main central screen is just tiny. “Miniscule” is what I wrote in my notes. My phone has a bigger display than this. 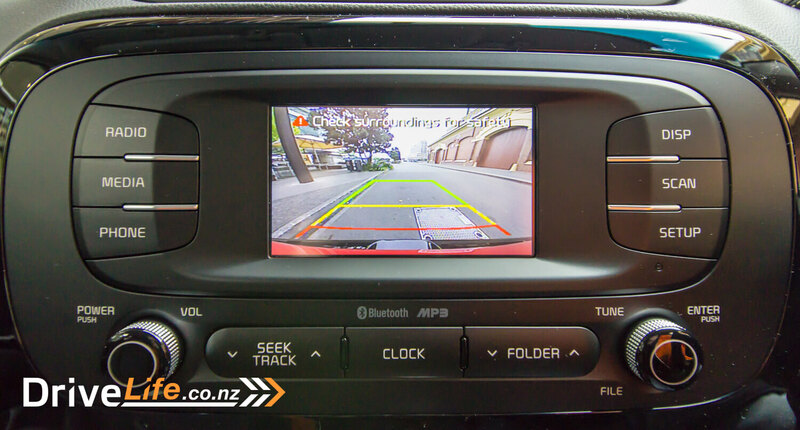 Kia has let the side down here – it’s almost unusable as a reversing camera display, and the other issue is that it’s not wide angle at all – when in reverse, it’s like tunnel vision – just long out the back, and that makes it very difficult to judge how far away objects are. Thankfully there are reversing sensors. The other issue I had with the reversing camera was at night, in the rain. It’s almost impossible to see anything in that display. I ended up opening up my door while reversing to make sure I didn’t hit anything. Come on Kia, you can do much better this. Of course the reversing camera doesn’t help when you are going forward, and the big C pillar is still there. The huge C pillar isn’t a deal breaker, and you get used to it when in normal driving, and the side mirrors are big enough to help out here. But that display…tiny. On the plus side, there is a single switch to turn the display off, which I like to see cars have. Generally though the inside of the car is pretty darn fine. 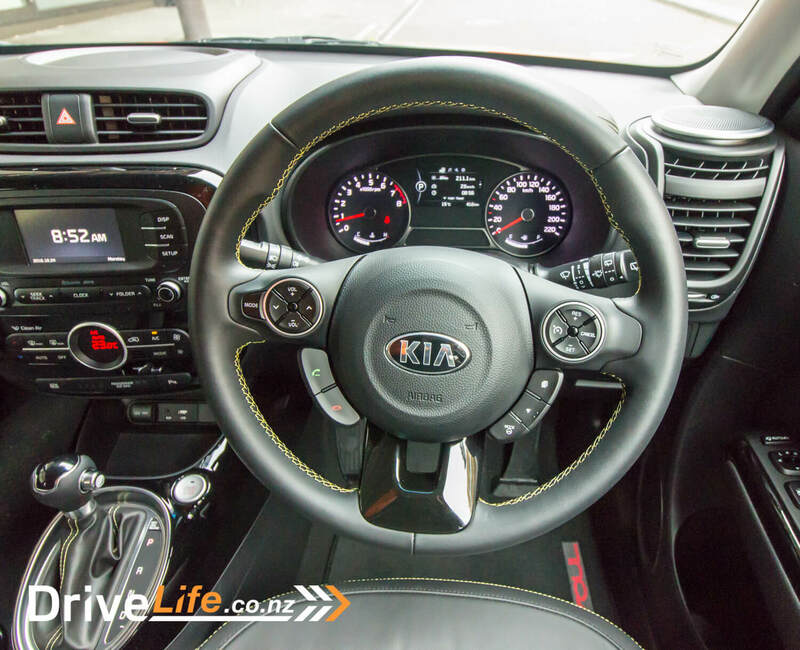 The leather steering wheel has a great feel to it, and the steering wheel controls are near on perfect – well placed, good button sizes and easy to use without looking down. There’s also a 4.3” driver’s information display, with all the normal features. I did notice though that when using Bluetooth for music, it doesn’t give you the track name, it just says BT. There’s auto lights on the Soul, but no auto wipers – same as the top of the line Kia Carnival I had. Strange thing to not have on the top of the range model. 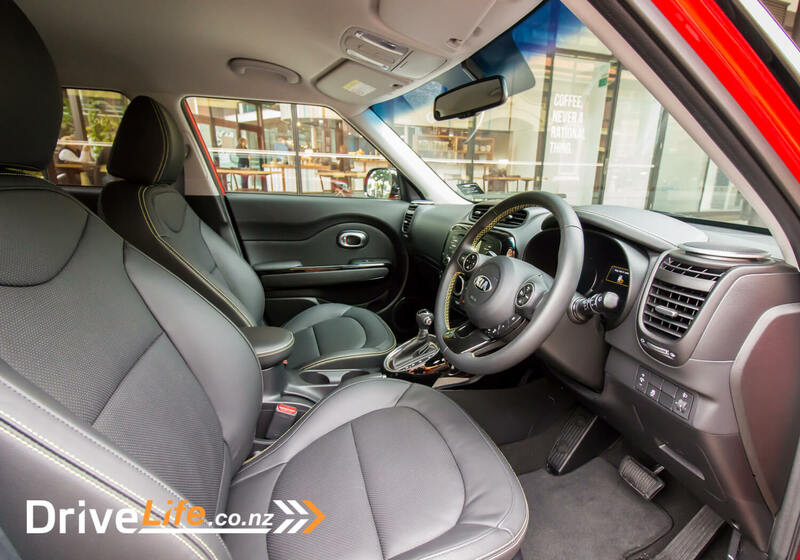 However the heated and ventilated seats make up for it – both are three-stage, and the single button does the heating and chilling. I can’t think of another car that retails for $35K that has both heated and cooled seats, so bonus points to Kia here. The Soul has “Floating Tweeters”. They stick up from the dash and the sound from the tweeter actually comes out just above the vents, which are below the tweeter. The stereo itself is very good and sound quality more than good enough, and I rate the sound out of those tweeters as excellent – great clarity at higher frequencies. Just one negative here: the floating tweeters reflect straight onto the windscreen, which can be a bit distracting. 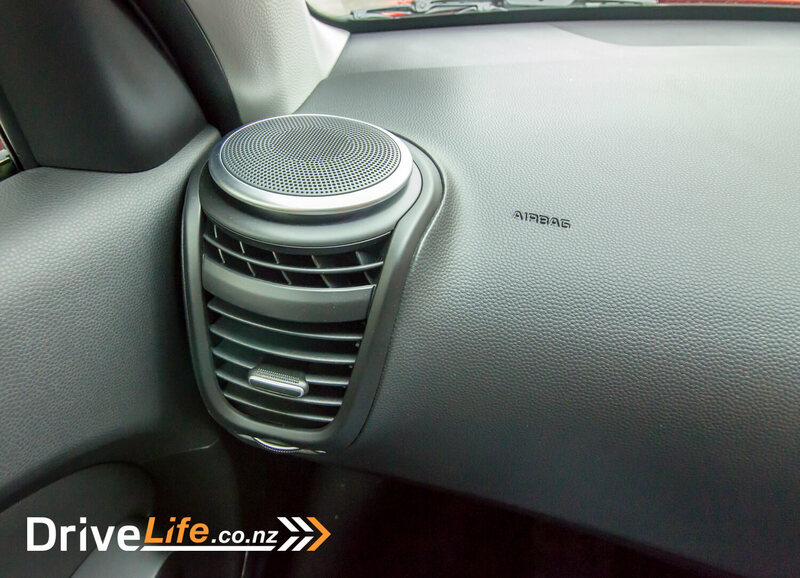 One annoying thing with the stereo, and some other manufacturer’s cars do this: you are connected to Bluetooth, you get out of the car and when you get back, the stereo switches to radio. Painful. You would think with vertical rear door, boot space would be good, and you’d be right. It’s got 354 litres back there with the seat up; keep in mind this car is only 4.1m long. The boot itself is pretty deep, and you are going to get quite a few tall plants from the nursery in there, if that’s your thing. 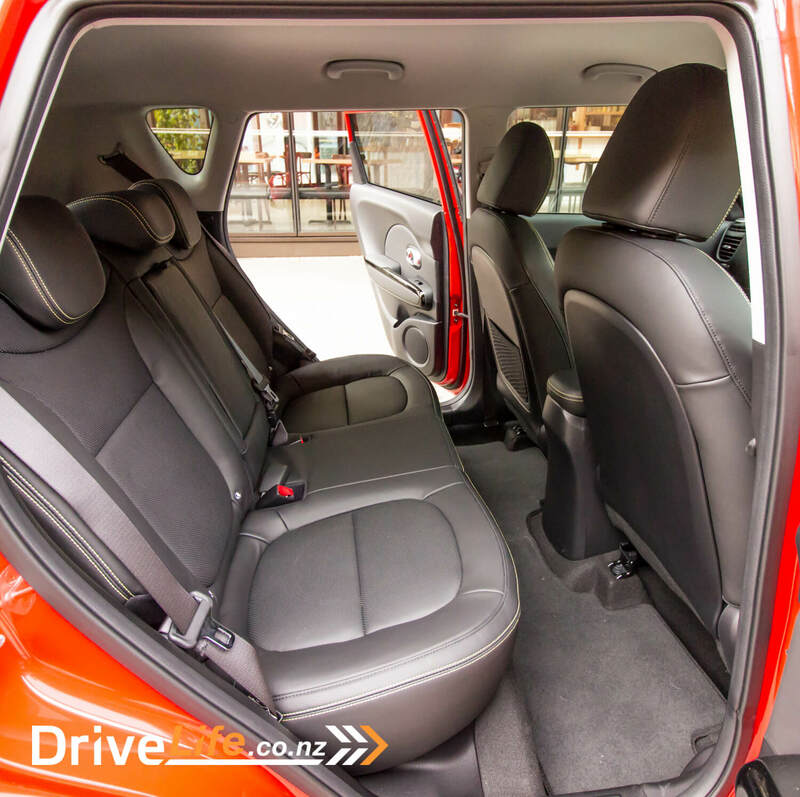 Rear legroom too is excellent – there is a fair amount of space back there, and the car’s 1.8m width and interior design means rear seat passengers aren’t too crunched up. Build quality on the inside (and out) of the SX is excellent. Everything fits perfectly; no noises to indicate anything but a quality car. Cars that look this funky should drive well, in my opinion, and the Soul generally does. It’s an easy driver, just one of those brainless get-in-and-drive cars where most of the time you don’t have to think too much. That’s a great testament to the designers. With the visibility (except for that C pillar), around town and motorway driving is a breeze. The brakes have excellent feel to them, and are one of the highlights – you can modulate them really well and can always tell what they are up to. The steering on a Soul is changeable to one of three modes: Normal, Comfort or Sport. They call it Flexi Steer and you can read this as Normal, too light and heavier. That’s all it really does – you don’t get any extra feel through the steering, and Comfort is so light it’s a bit crazy. A bit of a gimmick, and I just left our test car on Normal – and that was fine by me. General feel through the steering was on par with the rest of the class, and certainly no worse. One great feature of the steering is the super-tight 5.3m turning circle – impressive. It seems to get a u-turn in in crazy-tight streets. 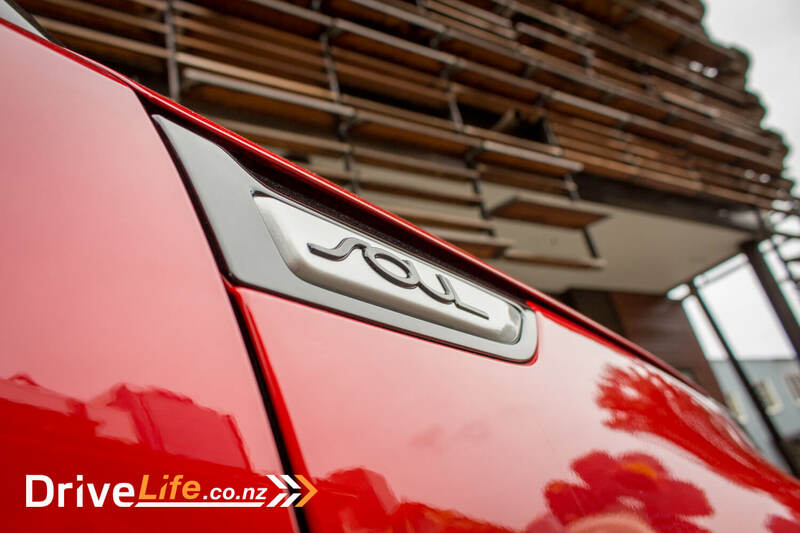 The suspension on the Soul is super-quiet – there is no noise to be heard on almost any bumps. It reminded me of the CX-9 I had a few weeks ago; that totally impressed me with the lack of any suspension noise, so that is saying something for the Soul. On the car there’s also an ‘Active Eco Mode’, but for the life of me I felt no change in the car at all. You would think it hold gear changes for longer or something like that, but I didn’t pick up any sort of difference. I’ve got to say, that 2.0-litre engine is a bit of a disappointment. It’s a little noisy – not badly so, but not as refined as I had expected. 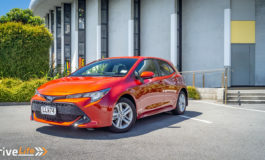 Also, it’s not sprightly – these days, I expect any 2.0-litre engine to be pretty peppy, and it is straight off the mark, but motorway driving – even solo – sees a gear change down or even two on any sort of acceleration. There’s 113Kw of power and 191Nm of torque, so it should be better. Still, it’s not bad and most people would find it just fine for everyday use, especially around town where I expect any soul with a Soul would spend most of its time. The cruise control isn’t adaptive which is a shame, but at $35K you can’t expect to have that. It works just as it should, although you aren’t shown the set speed in the driver’s information display. All in all though the Soul is a fun car to drive – it does have that something that make you enjoy the daily drive. The Soul is rated at 8.4L/100km, but I only managed 11.3 on a fairly even run of city/highway driving. 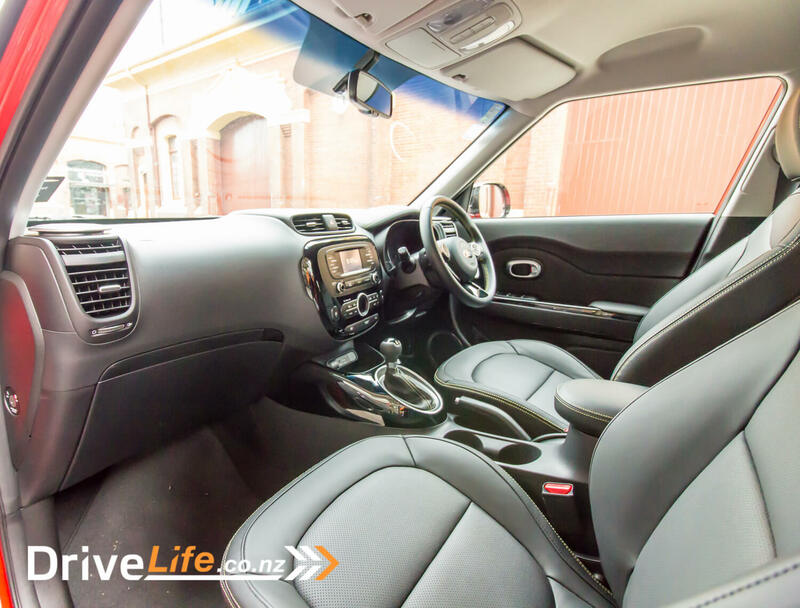 Surprisingly, if you want a smaller crossover SUV that’s a bit funky looking and stands out from the crowd, New Zealand is a bit spoilt for options. And all under $40K…! 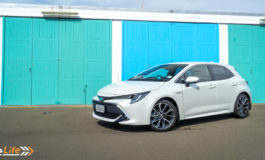 Do you need to buy that hatchback or would you like something a bit out of the ordinary, and perhaps more practical? 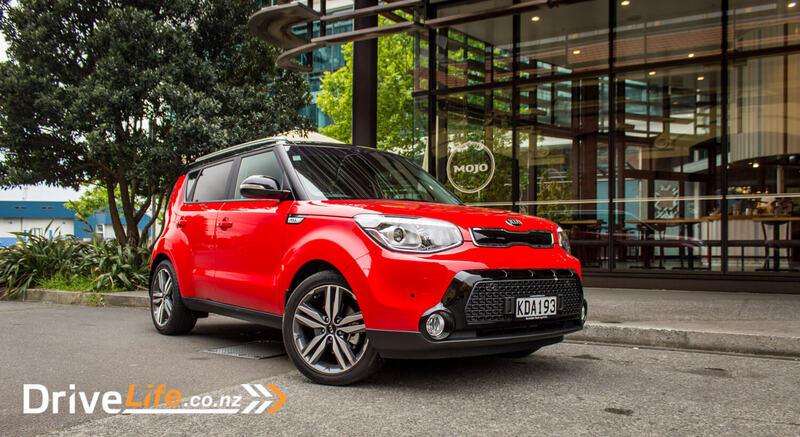 The Soul ticks nearly all the boxes that I would have to buy this sort of car; funky looks, plenty of space, comfy seats, and good value. It also has a design that I think quite a few people look for: it’s just that bit higher off the ground for my father-in-law to get into and out of. Most ‘normal’ cars are too low for some elderly people, and that makes cars like the Soul a good choice, without needing to go ‘full SUV’. But it lets me down in a couple of areas – I just couldn’t get over that tiny media screen. It really detracts from what is a good package. 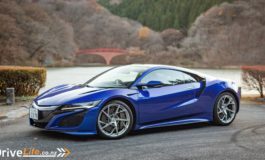 Then again the general driveability and fun-factor is there, and for this sort of money you are getting a very well-equipped car. Deciding on a Soul rating had me torn. There were things I didn’t like on the Soul, but overall it’s a nicely packaged car, and at a good price. Is there something a little special about the Soul that makes me want to like it more? I can’t put my finger exactly on it, but yes. In the end I rated it at 4 Chevrons – it is much more than a cafe cruiser. Previous article LEGO Volkswagen Golf MK1 GTI - I Want One ! !